Home > Activities > Catch! 1. 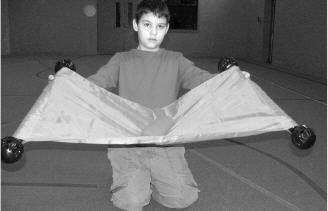 Create a large catcher’s mitt using two 16” tubes, four spheress and one curtain (see picture above). 2. Slide the curtain onto both 16” tubes and attach the spheres at each end of the 16” tubes to hold the curtain in place. 3. Repeat these instructions to make another for a second player. Make up to four structures if in a small group setting. For the first time practicing this activity, use bean bags that are soft, but have some weight so they do not easily roll out of the catcher’s mitt when caught. For safety purposes and until a rhythm is found, use the softer bean bags in case the child’s body is accidentally hit. Be sure to review the rules of the game (as stated in the “Activity Instructions”) prior to beginning. Ask the child or group to repeat the guidelines of the game before beginning to ensure comprehension and to promote safety. 1. Sit down in a circle with the players of the game (if in an individual therapy session, sit across from the child on the floor). Wait until you have their attention and then review the rules of the game in the box below. 1. The purpose of this game is to get the bean bag (or sphere) into the other player’s mitt. Toss the bean bag gently so the sphere lands right inside the mitt. 2. Always be ready and watching where the bean bag (or sphere) is so no one gets hurt. 3. Wait until the player who will be receiving the sphere is looking directly at you so you know he/she is ready Practice saying their name before you throw the bean bag to them so they are ready to catch it. If working in a small group setting, remind the children that we are all on one team and we are working together to toss and catch the bean bags as many times as we can. 2. If working in an individual therapy session, stand across from one another. If working in a small group, players should be positioned standing in a circle so everyone is able to see each other. 3. Read the following Activity Challenge Box. Challenge: Toss the bean bag (or Toobeez sphere) back and forth without dropping it! 4. Set a goal with the players as to how many times the team should toss and catch it without dropping the bean bag. 5. Begin by having the therapist model the guidelines of the game. They should call out the other player’s name, wait for their attention, and then toss the sphere to the child. Therapist Tip: To toss the sphere, begin by cradling the sphere in the curtain basket, when ready to toss the sphere, smoothly and evenly outstretch both arms at the same time to stretch the curtain out. This motion will pop the sphere up and out of the basket. 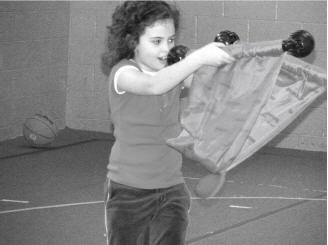 You may need to take a step forward while outstretching your arms in order to aim the bean bag toward the other player (see picture instructions below). 6. The child should repeat the therapist’s approach to the game and follow through with the toss. It may take many minutes of practice to get the rhythm of the toss and the catch. Be patient and encourage the players to keep trying. 7. Continue tossing the bean bag (or Toobeez sphere) until your goal is reached! This is a complicated task and may not be appropriate for younger children as it may cause extreme frustration. For younger children, please see the variations listed at the end of this activity. 8. When the activity is complete, move on to the Discussion and Processing questions. Observation of the child’s participation, his/her attention to the task, and frustration level. If you begin noticing frustration, challenge the child to continue trying, but be sure to modify the activity so the task is always presented as a “just right” challenge. 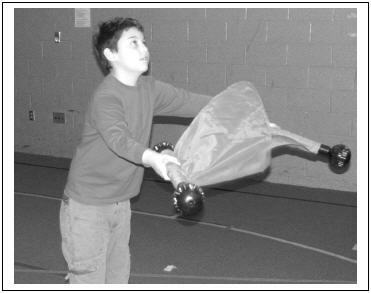 Observation of the child’s motor control and ability to smoothly coordinate both sides of the body to toss the sphere. Was the task broken down into simpler, motoric tasks or steps? Was the task increased in difficulty if the challenge was too easy? Did you like playing catch this way? What was easy about it? How did you feel after you successfully tossed and caught the bean bag (or sphere) in this tricky way? How do you feel after moving around and playing this game? Do you feel more awake? How could we work together to utilize this activity and movement activities in general across all areas of the child’s day? 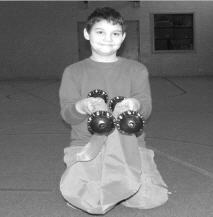 Instruct the child to catch as many bean bags (or balls) in his/her catcher’s mitt as possible. After catching the bean bags, lay the catcher’s mitt down on the floor and he/she can pick up the bean bags one at a time and underhand throw them back to you. Involve more than one bean bag (or sphere). If working in pairs, instruct the two players to toss the bean bags at the same time to the other player. This requires quick thinking and planning for tossing and catching at the same time! 3. For a small group. Begin in a circle and decide in which direction the bean bag will be moving. Each person should look to that direction and say the name of the person standing next to them on that side (that is, the person to whom they will be tossing the bean bag). Now look at the person on the opposite side and say that person’s name. This is the person from whom they will be receiving the bean bag. The therapist should begin the tossing to model the task (look at the person to whom they are tossing the bean bag, say the person’s name, wait for them to look, and then toss the bean bag). Set a goal for the number of times to complete the circle or time how long it takes to get around the circle, and then try to beat that goal or time! 4. Increased difficulty for a small group. Follow the instructions above. Instead of tossing it to the right or left, instruct the child to choose a person on the opposite side. Each person must choose another player standing across from them (not someone on their right or left). The child can identify who will be receiving the bean bag and to whom it will be tossed. Set a goal for the number of times to complete the circle or time how long it takes to get around the circle, and then try to beat that goal or time. For a big challenge, have more than one bean bag in play at the same time!